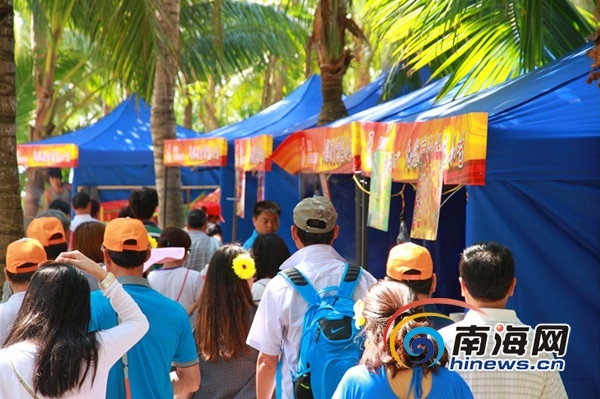 On the morning of March 9, the Eryue’er Hainan Temple Fair, one of the 5 main themed activities of the 9th Dragon-Head-Raising Festival (Long Tai Tou Festival), kicked off at Sanya Dongtian Park. The food court for specialties at the temple fair, situated on the opposite side of the park’s Yelin Bar, offers Hainan Baoluo rice noodles & Hou’an rice noodles, coconut rice, Chongqing’s Hot and Sour Rice Noodles and Mongolian specialties, which have proved extremely popular with tourists. The temple fair will run until March 13, and a series of celebrations including the South China Sea Blessing Ceremony, the Dongtian lecture, and a Dongtian calligraphy and painting competition will be held on the day.